Magento is known as one of the most popular content management systems for eCommerce websites. Being used by millions of websites on the Web, Magento also has some of the best examples of eCommerce UX and UI design done right. You can get inspired to build your next online shop by browsing these excellent Magento websites. Ceraudo is a Magento eCommerce website built by the award-winning UX Design and Development studio Diligent Commerce. The studio specializes in creative eCommerce experiences for luxury brands and Ceraudo is an example of a premium web design done right. This website design creatively combines minimalism and traditionalism in a vintage-inspired design that keeps up with the latest trends in web and UX design. The site has a fixed menu that gently blends with the header image. Categories are presented by clean banners while special items take a central place in a static carousel that’s elegantly highlighted with a subtle patterned background. IGK is a premium eCommerce website for luxury hair products that’s built on Magento. The website has a fluid design that allows users to elegantly scroll between different page sections and elements in a parallax-inspired manner. The website completely embraces the minimalist style and incorporates various animations to keep the visitors engaged. The design layout follows a unique grid system while the scrolling effects give the design a touch of vivid beauty. N21 is a luxury Magento eCommerce website created by the NY and Italy-based design studio Diana. The website’s home page is inspired by lookbook designs and has an image-driven layout that directs user’s to the shop’s main categories. The shop itself has a typical minimalist look and uses a traditional grid system with subtle text and large images that focus the visitors towards the new fashion trends instead of turning their attention towards the prices. Virginia Hayward is a Magento eCommerce website built by the UK web design studio Fisheye. The website has a complex structure and special user features that make the shopping experience unique. 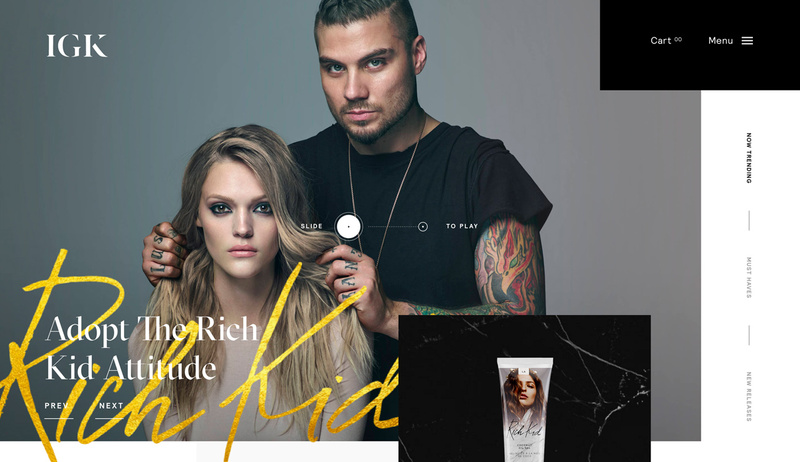 The main site categories are displayed below the fold with beautiful image banners along with a single carousel for highlight products and customer feedback. The website has an advanced item filtering system and a product personalization option available from the main menu and the notification bar above it. This multi-purpose premium Magento theme is an Awwwards nominee created by the Vietnam-based studio ArexWorks. The theme has more than 10 unique layouts for fashion, furniture, cosmetics, and other industries along with three gorgeous header styles to choose from. The theme has a basic brand shopping section that can be extended with tools like the shop by brand extension to get more detailed product pages and additional features. Sebian has a clean menu with special labels for better visibility. Made is a popular UK eCommerce website for furniture and interior pieces built with Magento. The website has a boxed layout and a large menu that leads to category-specific landing pages.The home page features a few highlight items while category pages display products in a tight grid layout. The shop has an advanced product filtering system. The design relies on simplicity and invites users in with high-quality imagery. Schneiderman’s is a large eCommerce website built on Magento. The website has a huge collection of items separated into different categories that can be accessed through the main menu. Product filtering can be done for brands, prices, and style. The category pages have a large header image and grid-based items display. Among the items, there are special banners that neatly present offers, advertise different products, and direct users to other landing pages. Superette is a beautiful Magento eCommerce website that sells luxury fashion and home goods by different brands. The home page design is very clean and intuitive. It displays categories only with images and no text. The category pages have an unconventional design that combines a left-side menu with full-width high-definition photography. The website also has an interactive Instashop where items are displayed like Instagram images. The different items on the images are tagged visually and linked to the shop.